Easy St Personal Training Ltd (Easy St PT), set up by Jamie Ford, is a new fitness gym and nutritional advice facility in Edenfield Road in Rochdale. Based in a spacious ex-car showroom, the gym needed a complete re-fit which included the network infrastructure and IT equipment providing, in addition to the software and installation. As we normally do, we started by holding a meeting with our client to talk about their plans, and to work out what would be the best solution for the business. By learning about the company, looking at what type of service they wished to supply, what their budget was and how they wanted to work, we could find the perfect solution for Easy St PT. Creating an integrated system for them was very high on their wish list, as it would enable their staff to offer the very best service to their clients and improve their efficiency. Easy St PT had completed the refurbishment of their reception area and the broadband was connected, so we were able to install their new desktop PC with no issues caused by working around other contractor’s activities. We also refurbished their old Epson printer for them back at our workshop, giving it a new lease of life and reducing any other costs. 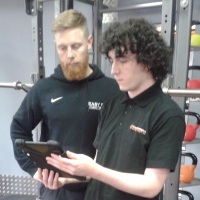 To allow their personal trainers and physios to record treatment and training notes at the time of consultation with their clients, we supplied 2 Android tablets which, along with the desktop PC, were connected wirelessly to the new Easy St PT network. With the assistance of Easy St PT’s web developer, we connected the SharePoint application to the easystpt.co.uk domain which has now given their clients the ability to book their appointments online and to have all their progress reports in one easy, accessible place. Finally, we gave Easy St PT’s staff a 30-minute training session to prepare them to use their new system and rounded the day off with an additional 30-minutes administrator training for director, Jamie Ford. After the initial installation Easy St PT wanted an additional area on the templates for further information to be recorded during training sessions. This was completed remotely by logging into Easy St PT’s SharePoint site and was completed within an hour, meaning that our client was ready to go almost immediately.